Following the wild success of our previous three farming volunteer programs, Young Pioneer Tours will be returning again to aid the farmers with a day’s work in the fields. We’ve created this program specifically to give you an exclusive insight and experience as we not only work hard, but also play hard, eating and drinking with the local farmers and their families and friends after the day is done. Chilgol farm is located in the far outskirts of Pyongyang. This farm is operated by over one hundred different Korean families capable of growing cabbage, rice, strawberries, plums, tobacco, sesame seeds, potatoes, corn, cucumbers and chillies. 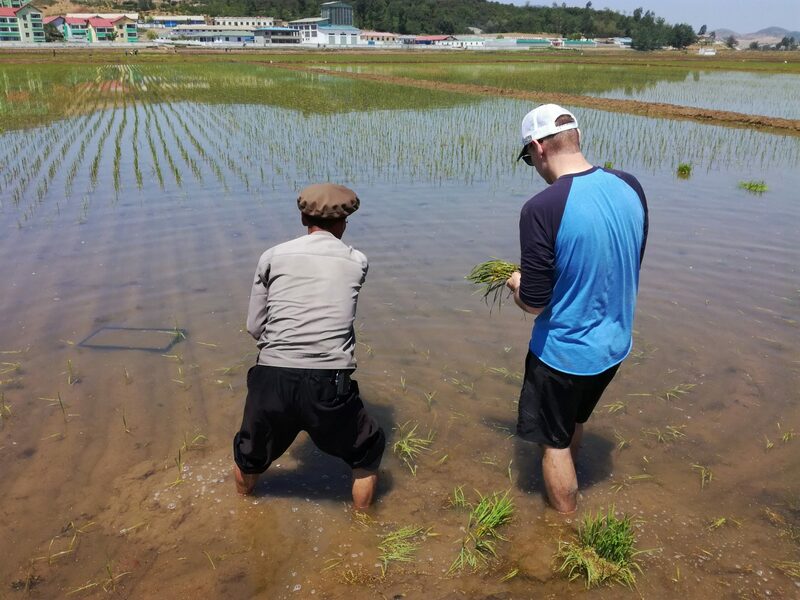 To partake in this program you must be prepared to get down and dirty with the farmers as we combine teamwork to complete the daily tasks of transplanting rice by hand and other odd jobs around the field. It’s not exactly backbreaking labour, so anyone can join in! 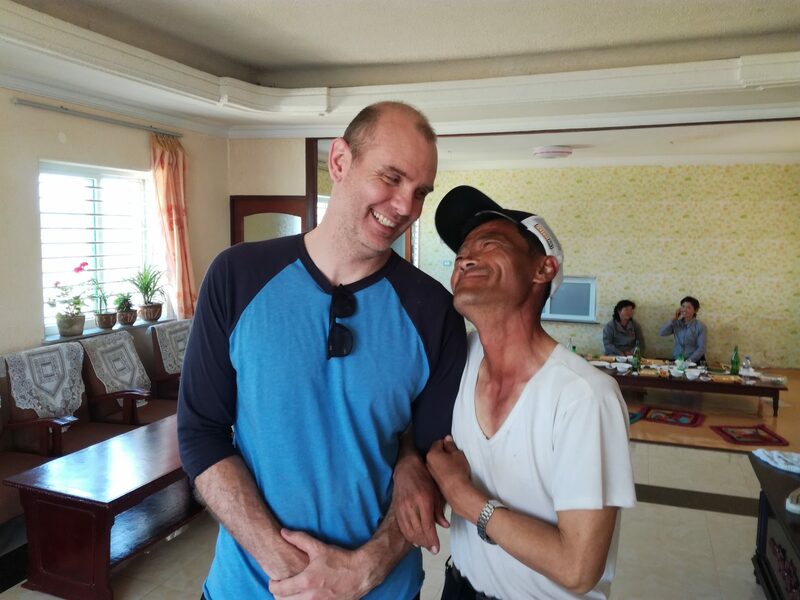 A YPT western guide will accompany you to not only help you with the dirty farm work but also to show you the must-see sights of Pyongyang to give you a better understanding of the country. This trip is a complete non-profit program. All proceeds YPT makes from this program will be used to purchase goods and valuable gasoline tickets which will help the farmers to run tractors and generators – items that often go unused on the farm due to the shortage of fuel in the country throughout the year. You can read more about our volunteer program here. 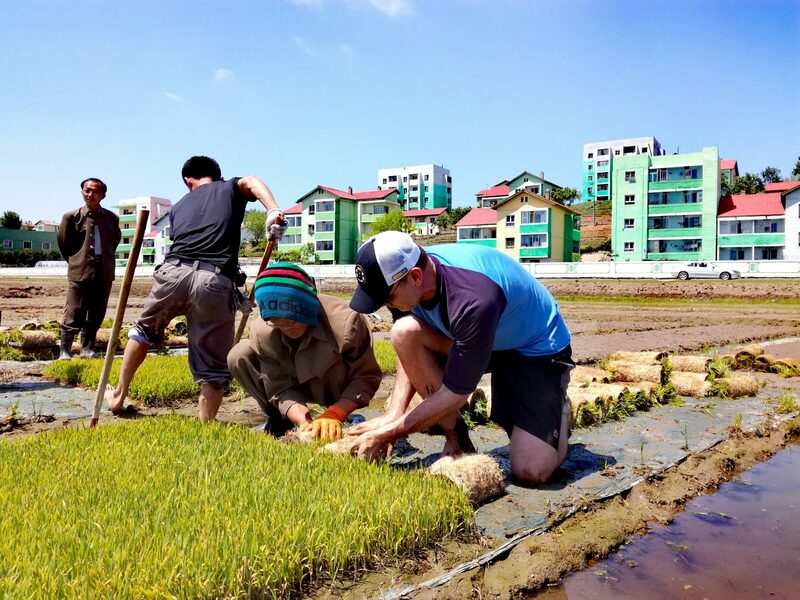 This farming volunteer program is an incredible and unique opportunity for you to not only build relationships with farmers and their families, but also to learn a thing or two about traditional organic farming, a skill that the DPR Koreans are renowned for. During this specific tour the Pyongyang Trade Show is in town and we’ll have a unique opportunity to explore the exhibitions that are held here by local and international business. Think of this as a DPRK version of the CES. Train takers depart Beijing Central station at 5:25pm for the 24-hour sleeper train to Pyongyang. Train group arrive in Dandong at 7:00am for Chinese border control then depart for Sinuiju at 10:30am for the extensive border control from the DPRK side. Flight takers depart Beijing Airport Terminal 2 on Air Koryo at 12:00pm (Group will meet at Air Koryo check in counter). Flight group arrive in Pyongyang at 4:00pm to a warm welcome from your Korean guides. Train group arrive at 6:45pm to an equally warm welcome. In the evening your YPT guide will show you around the hotel before taking you for drinks and to get to know your Korean guides. Dinner and overnight at the Yanggakdo Hotel. 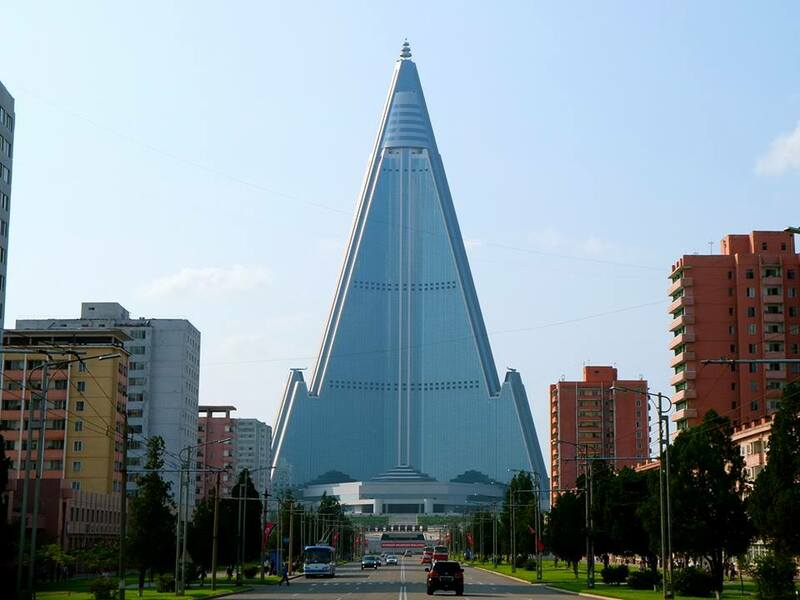 Kim Il Sung Square – the Central Square of Pyongyang city and the place where all the action happens! 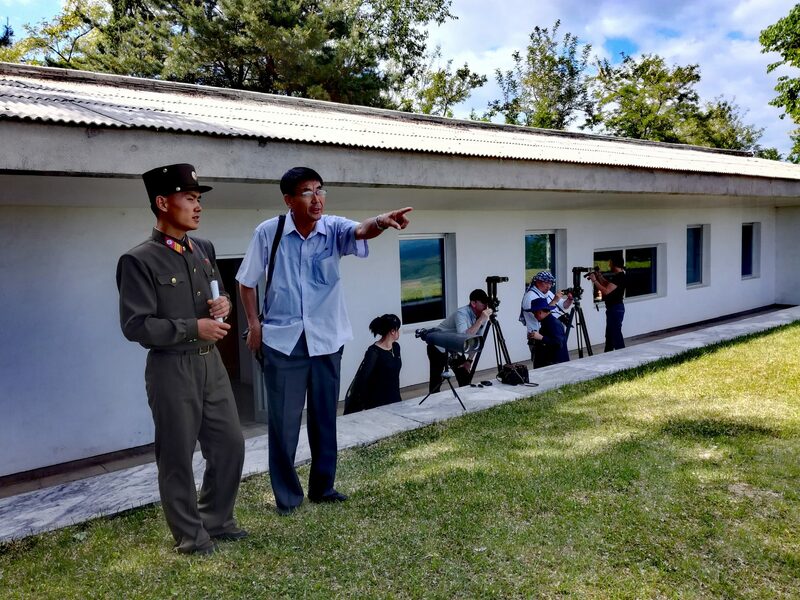 Visit the recently renovated Korean War Museum – let the expert local military guide show you around the enormous museum featuring dioramas, locally used weapons, tanks and captured American equipment! USS Pueblo – the only US Naval Ship still held captive by another country. Monument to the Party Foundation – built in 1995 to celebrate the 50th anniversary of the founding of the Worker’s Party. Stop by Taedonggang Brewery #3 for refreshments (beer, soda, coffee available). Dinner at the Korean Hot Pot restaurant. Overnight at the Yanggakdo Hotel. Wake up early and drive to the farm to meet the local farmers and their families. They will give us a tour around the farm and the fields while explaining what our assigned tasks to be completed are for the day. We will be split into smaller groups, and farmers will be assigned to each group as we head out to complete our tasks! Time for a break! We’ll eat a home-made meal with the farmers and will be joined by their families as well! Back to the field to do our best to complete the day’s task. As we work throughout the day the families will prepare beers and snacks for us to drink together for a job well done! Relax and replenish ourselves with dinner at the Duck BBQ restaurant. Head back to the Yanggakdo Hotel for a well-earned shower and sleep. Kumsusan Palace of the Sun – Former office of the President, this building is now where the leaders Kim Il Sung and Kim Jong Il lie in state. Revolutionary Martyr’s Cemetery – the resting place of the greatest anti-Japanese revolutionary fighters. Each grave features a bronze bust of the hero laid to rest within. Lunch at the Gold Cup restaurant. Stop by Kwanbok Department store, this is Pyongyang’s largest department store and our chance to exchange our foreign currency into local DPRKorean Won and to spend it on items. Here they have a supermarket, food court, clothing retail and other small stalls selling nifty little things. Visit Mansudae Art Studio – the nation’s most important art work and statues are created here. This is where we get to meet some of the local artists too. Head to the Rakwon beer brewery for some cheap beers and drinks (.5 euros each). Dinner at a local KITC restaurant to try the local famous Pyongyang Cold Noodle dish or traditional Korean Bibimbap. Up nice and early to drive to Kaesong and the DMZ. Koryo Museum – Korea’s first university and now a museum of history and culture. Also home of the best stamp and propaganda poster shop in the DPRK – so don’t forget your wallet! The DMZ – See one of the most tense places on earth complete with a friendly KPA officer who will not only give you a guided tour but also keep you safe. Also the only place you can take photographs of and even with a solider! The DMZ concrete wall – See the wall and meet the DPRK’s coolest general as he takes us around this exclusive area. Drop by Sariwon City (capital of North Hwanghae province) to walk in the local folk custom park and view the city from the mountain pagoda. Try locally brewed Makkoli in the local tea house. Photo opportunity of the Monument to the Three Charters of National Reunification that stands over the Thongil Highway. Dinner at the famous Duck BBQ restaurant. Taedonggang Diplomatic Club – There’s local and imported drinks, karaoke, billiards, ping pong and a great chance to meet some local Pyongyang expats! Train members depart at 10:25am for Beijing on train K28 to enjoy the beautiful landscapes and countryside on the ride back to China. Train members arrive 9:00am at Beijing Railway Station. Further Reading Contents Not Available. 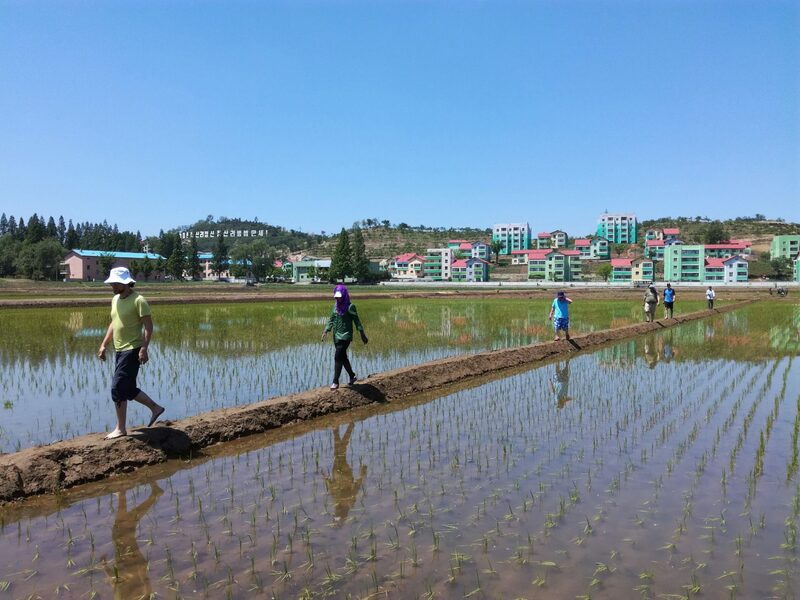 Help local farmers with a day’s work in the fields for an exclusive insight and experience into DPRK farming. Work hard, play hard. Eat and drink with the local farmers and their families and friends after the day is done. Kumsusan Palace of the Sun - The massive mausoleum where the country’s former leaders now lie in State, it’s a place that truly has to be seen to be believed. 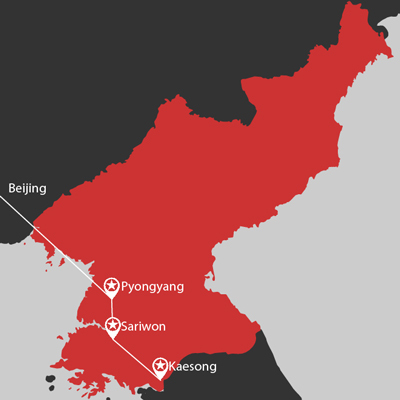 Visit the DMZ, Kaesong City and Sariwon City.